In areas where renewable resources were scarce or uncertain, widely separated, and accessible only seasonally, settlers developed strategies geared to the exploitation of these resources throughout the year. The utilization pattern was normally woven into a seasonal round of activities. 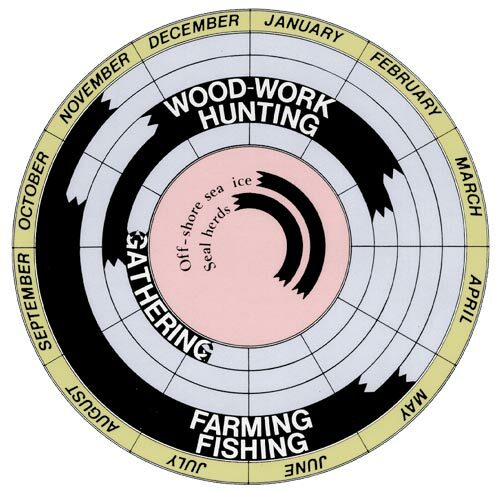 Activity cycle of a subsistence household in rural northeastern Newfoundland. Under ideal conditions, each exploited resource complemented the others throughout the year. In the northern parts of Newfoundland there was usually a period of relative inactivity in spring, after woodswork had ceased and before the first appearance of the cod stocks. For settlers moving into the harbours and coves of coastal Labrador and northeastern Newfoundland during the 18th and 19th centuries, however, this period often became a time of intensive and commercially rewarding activity. By late winter and early spring, this coast was blockaded by local and arctic ice in most years, and with the ice came harp seals. Data: Department of Transport, Ottawa. Reproduced by permission of C. W. Sanger © 1998. Adapted by Duleepa Wijayawardhana, 1998. The seals appeared for one to two weeks in late December and January as the herds migrated southwards from the Arctic, and again in late February and early March as they swam northward to give birth on the drifting pack-ice. Reproduced by permission of C. W. Sanger © 1998. Adapted by Duleepa Wijayawardhana, 1998. Pioneer settlers in the more northerly parts of Newfoundland quickly discovered that migrating harp seals could be caught in nets attached to shore as they swam south; this was called the landsmen seal fishery. Later, towards the end of the 18th century, the patches of whelped whitecoats became the focus of an annual spring seal hunt carried on in larger vessels. Seals constituted an additional and welcomed resource during a commercially quiet period in the traditional annual round. The Newfoundland and Labrador seal fishery evolved through overlapping phases. Each phase was characterized by the acceptance of new technology, which brought with it new strategies, techniques, and changes in patterns of financial investment and ownership. 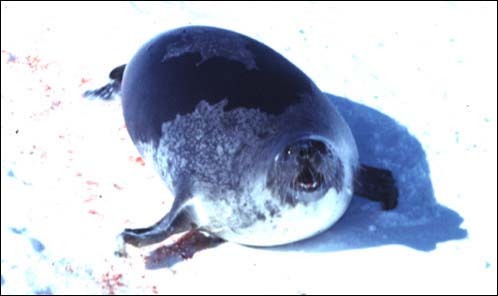 The number of sealers declined and different regions became involved. In spite of new technology and other changes, catches of seals declined, and until recently, there were reductions in this resource base. Every major infusion of technology was primarily associated with	the sealers' desire to improve their abilities to cope with the obstacles	encountered when attempting to gain access to the seals. To understand the Newfoundland seal fishery, therefore, it is necessary to examine the main characteristics of the resource; and of the environment to which it has adapted, and into which the sealer must intrude. The sealing industry developed in response to the abundance of sea mammals that frequent Newfoundland and Labrador inshore waters. The very nature of the venture has been strongly influenced by the habits and character of the seals. Although hood seals have sometimes been harvested, the harp has been the mainstay of the sealing industry. Pregnant harp females in the western Atlantic herd swim northward in February in search of suitable birthing ice. They form large groups and give birth at approximately the same time each year, so the young seals (whitecoats) are born in close proximity to one another, forming whelping patches that often cover several square kilometers of ice. The harp pup loses its coat of white downy hair within three weeks. Known then as a "ragged-jacket," and finally, in its first year as a "beater," the young harp in the process of becoming an adult seal (mature, saddleback, harp) is called a "turning seal" (turner), "immature," or "bedlamer" (bête de la mer). Sexually	mature at approximately four years, adult seals have an average life span of over 20 years. Initially harps of all ages were caught by landsmen. However, the whitecoat and moulting (shedding of winter coats) patches became the principal targets of the offshore sealing fleet. 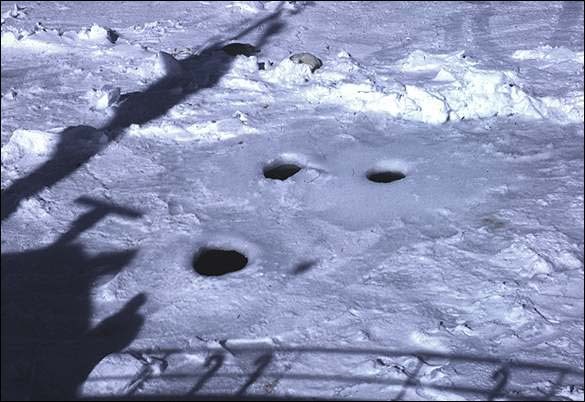 Although more vulnerable at this time than at any other stage in their life cycle, these seal herds were given some degree of protection by the hazardous environment, and the hunters' limited ability to navigate the icefloes. Of all the environmental factors that affect the harvesting of harp and hood seals during late winter and early spring, the most important is the quantity and condition of sea-ice. The relative importance of other environmental factors is determined by their influence on the growth, distribution and character of these protective ice-fields. The seasonal formation and movement of sea-ice off southern Labrador and northeastern Newfoundland (the "front") is generally away from the land toward the south and the southeast. This occurs in response to the general southward flow of the Labrador Current and the prevalence of offshore westerly winds. While varying greatly from year to year, the total area of the whelping and moulting patches has always been extensive. The normal pattern of seasonal growth, and the degree of variation in the location of pack-ice within the same year, has also been wide-ranging. Annual variations occur as a result of temperatures, ocean currents and prevailing winds. Within each season, however, the largest single determinant of the relative day-to-day configuration of the ice-floes is the strength, duration and direction of winds. The presence of offshore pack-ice during the early spring, then, provided many coastal settlements on the headlands and outer islands with relatively easy access to a rich resource and a temporary surface on which to hunt. This practice, however, also involved difficulties and hazards in navigating vessels and harvesting the seals. If they wished to be successful, or even to survive, sealers had to adapt to the dangers posed by wind, sea and ice. Much depended on their knowledge and experience, and to a large extent upon the technology at their disposal.